The Eli Lilly stock price today (Wednesday) fell as much as 4.8% after the company released new trial results on its Alzheimer's drug solanezumab. Eli Lilly and Co. (NYSE: LLY) officials released data from a follow-up study on two of the drug's earlier trials. The Alzheimer's drug fell short of its goals in the first two trials, but the new data showed encouraging signs. The new results indicate the drug could slow the course of mental decline the longer patients take it. The drug was also said to be more effective among patients in earlier stages of the disease. While the results were encouraging, they fell short of investors' expectations. The follow-up study compared new patients with those who had been taking the drug for over one and a half years. The patients who had been taking the drug longer showed stronger signs of the drug's efficacy. Solanezumab is designed to clear amyloid plaque buildup in the brain, which leads to cognitive decline. More than 5 million Americans suffer from Alzheimer's currently. That number is expected to triple by 2050. Effective Alzheimer's drugs haven proven historically elusive for the pharmaceutical industry. According to Financial Times, more than 120 Alzheimer's drugs have failed clinical trials since 1998. 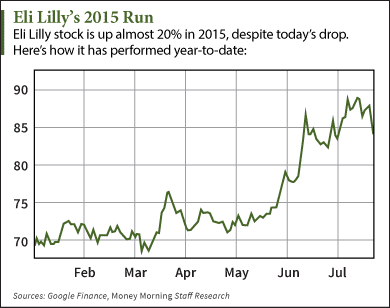 Including today's dip, the Eli Lilly stock price is still up 19.7% in 2015. It hit an intraday low of $81.50 shortly after the opening bell.